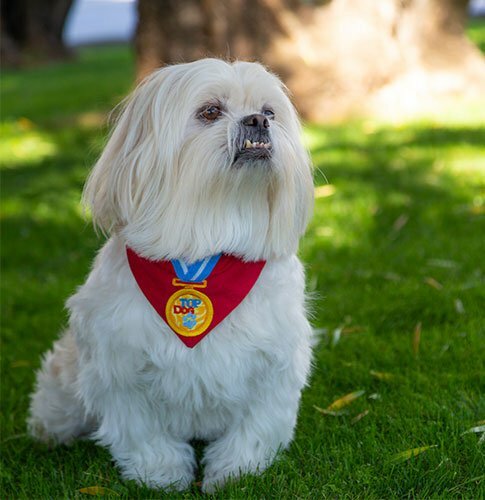 Meet Firm Spokesperson Scruffy | Law Offices of Vescio & Seifert, P.C. Scruffy was adopted from Halo Animal Rescue in February 2013. Scruffy is a Shih Tzu, Pekinese mix, or as we like to say “20 pounds of fluff.” At the time of his adoption, Halo Animal Rescue estimated that he was approximately two years old. Not much is known about Scruffy’s life before he adopted LOVS as his fur-ever family. We believe that he had a home at one point before joining LOVS because he was house-broken and he knew the command “sit.” Since joining LOVS, he has been officially known as the “office dog.” Most days, he can usually be found hanging out in his Mom’s office (Theresa’s office). When he is not sitting in on client meetings, he enjoys visiting everyone in the building in the hopes of getting treats, play time, and belly rubs. When he is away from the office, he enjoys hanging out at his mom’s house, visiting his dog friends at the ranch, and going on walks.